Seismic impacts, winds or human footsteps can trigger vibrations, causing high stresses on buildings and bridges, which can even result in their collapse. To reduce vibrations and to ease tension, we develop special compression springs, tension springs and HIFO springs for dependable vibration insulation. For many decades, we have been a spring technology specialist in the area of rail transport. In 1989, the first ICE train of the German Railway was equipped with GRUEBER springs. Every day, over 180,000 train passengers enjoy the comfort and safety of our spring solutions. For locomotives, passenger cars, commuter trains, double-decker train cars, freight cars and multiple unit vehicles such as the ICE, we develop and manufacture primary and secondary springs. GRUEBER supplies springs for chassis and lowering for the passenger vehicle after-market, for the tuning industry and for racing. 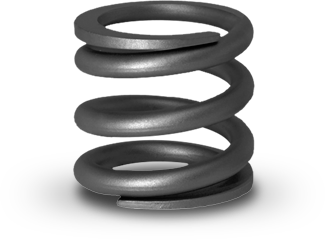 Here, the precise design of the springs is paramount in order to meet a wide variety of requirements. In this way, we make the optimum chassis adjustment possible and contribute to a high degree of driving comfort and greater safety. Thanks to reliable quality and a high resiliency, GRUEBER springs are used even in extreme conditions, such as those encountered in racing. Our customers, e.g. in the fields of agricultural machinery or robotics and feeding technology, build machinery and equipment that must work reliably and efficiently every day. Designed for quality and performance, these products generate maximum output with minimised downtimes and service times. With our wide variety of spring solutions and bent parts, we support you in manufacturing such machinery and equipment.